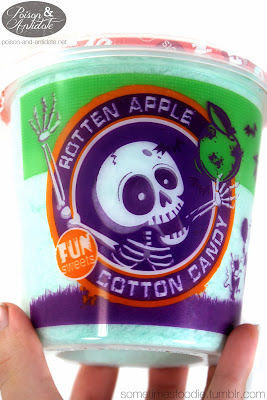 Sometimes Foodie: Rotten Apple Cotton Candy - ??? Rotten Apple Cotton Candy - ??? This was made by the same company as the Candy Corn Cotton Candy I reviewed a few days ago. For a novelty brand, Fun Sweets is putting a decent amount of work into their designs. I really liked the candy corn themed packaging and, although I could have done without the green stripe at the top, this design is really nice too. What brings this plastic tub to a higher level than most of the other novelty cotton candies? It's the simple purple silhouette-style art that wraps around the bottom of the container. It's classic, bold, and very well done. I would have liked to see more of the container use the purple color scheme, but the rest of the design isn't that bad. I tore a little bit of the fluffy green candy off of the container-shaped mountain and it tastes quite authentic too! 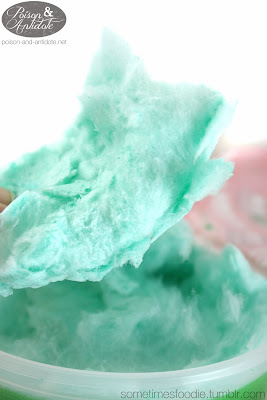 It is no where near biting into a green apple, but it is one of the more authentic fruity flavored cotton candies I have ever had. I'm not sure where my friends picked this up, but if you're an apple fan you have to try this!